This report identifies kept appointments for which no progress notes have yet been entered. You can enter notes directly from this report by clicking the Enter Notes button. 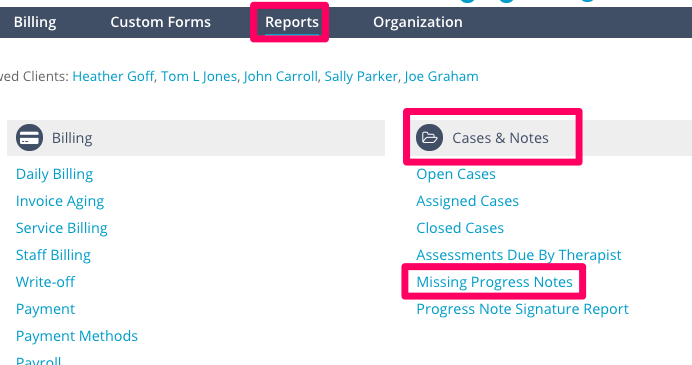 Go to Reports > Cases & Notes > Missing Progress Notes on the primary navigation. 2) Set the Date Range, Staff, and Client name. 4) In the results you can click Enter Notes to enter a missing progress note for a client right from the report. You will see the Create New Wiley Progress Note option if you are using Wiley Progress Notes.